Not all play involves games of tag or jumping rope. 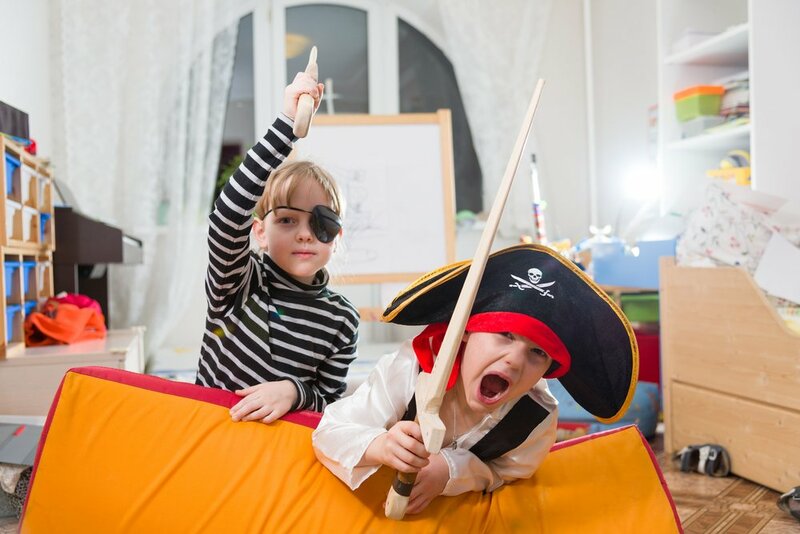 You may have seen the term “make-believe play”, “pretend play”, or “imaginative play” before, but what does this really mean? It might be a curious experience to watch a preschooler playing with blocks and talking to herself animatedly. As adults, we might think this feature of childhood is simply a phase of growth towards logical thinking. In 1962, psychologist Jean Piaget discovered that this “symbolic play”, although less sophisticated than playing with peers, sets the base for assimilating the adult world’s complexity. It’s the base for one of the characteristics that makes us human: imagination. Exercises the capacity to think from a different person’s point of view, and to understand that other people’s emotions and thoughts are separate and different from our own. It allows kids to get a sense of what others may be feeling, how they might react, and, therefore, how to deal with interpersonal situations. Develops the capacities for narrative thought, logical sequencing, and elaborate an experience into a story: with a beginning and end, order, and with social and emotional scenarios that coexist and may at times be at odds with each other. Allows children to safely feel and express anger, sadness, fear, and also gives them a way to control those feelings by steering the story onto familiar and happy outcomes. Russian developmental psychologist Lev Vygotsky understood pretend play (like all social experiences) to be a major catalyst of development and self-regulation. As Erick Erikson assessed in 1950, make-believe play allows children to explore different social roles and lets them develop a more sophisticated sense of future. They are able to imagine endless courses of action in the present, intersect with other people, revisit important memories, and anticipate possible outcomes for the future. Provides an early ground to learn and enact the rules of social life. When preschoolers play with peers in storylines constructed by their conjoined imaginations, they go through complex negotiations about the roles, settings, actions, and conversations carried out inside the play. As Vygotsky studied, this demands to continually apply social conventions, cultural rules, and create models of cooperation.